If you were given the task of conjuring up a concept that was the ultimate horror, the ultimate concept of hate, and torture, of misery and depravity, could you, in a thousand years, come up with a concept to top that which the Jews came up with two thousand years ago, namely the Christian concept of hell ? No, you could not. In that very concept, hell, is gathered together all the hatred, viciousness, brutality, criminality, fiendishness, evil and depravity only an unbalanced Jewish mind could lump together in one four letter word – hell. Think of it ! Of all the cruel and vicious acts that have possibly been committed here on earth, nothing compares with that one horrendous four letter word – hell. When the redskin Indians tortured their prisoners and finally scalped and murdered them, it nevertheless only lasted, at most, a day or two. When the vindictive Christians burned their “heretics” at the stake, it was all over within a matter of minutes and the victim was soon beyond the reach of pain. Even when during the Dark Ages over a period of months or years these same “loving” Christians tortured their enemies with the thumb screw or rack, the victim either passed out during the torture, or finally died from the abuse. When the communists torture, drug and resort to “third degree” tactics in order to force their political prisoners to “confess,” that too finally ends in death and the pain is over with. But hell ? The torture by fire is endless and unalleviated. There are no temporary pauses or mitigations of the pitiful victim passing out or fainting. The horrible pain of fire is relentless. It is not only local, such as only burning a hand or a foot. It is all over, presumably, since the body (or the spirit ?) is totally wrapped in hot searing flames. It is excruciating. You cannot faint, you cannot pass out, you cannot obtain any pain-killing sedatives, you cannot die. There is no relief, there is no way out. There is no reprieve, no pity, no forgiveness. The horrible pain is intense, it is all over the body, it is endless, it is forever. Can you imagine such a horrible concept ? Can you possibly in your wildest imagination conjure up anything more horrendous ? No you can’t. As we said before, only the depraved collective Jewish mind, filled with hatred and viciousness, could dredge up from the lowest depths of inhuman depravity the ultimate in such a beastly idea. However, we do the beasts of Nature an injustice. No beast or animal would ever even dream of such a horrible idea. One of the most terrible indictments we Creators can charge against Christianity is that it invented hell, and terrorized the minds of billions of its victims for nearly two thousand years with the horrible and depraved concept of hell. This horrible but idiotic idea has wreaked untold psychological damage on its gullible victims, caused untold misery to billions and sent thousands into insane asylums. One of the first and foremost goals we Creators have set out to accomplish is to demolish and forever lay to rest this horrible Jewish-Christian concept. 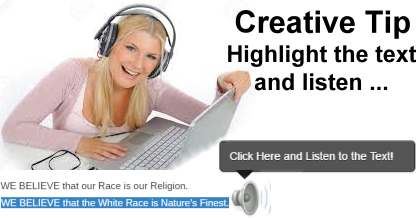 We aim to give the White Race a new freedom, namely, freedom from the fear of hell. What purpose has this horrible concept served ? When we ask this question we must also ask, regarding whom ? As far as the White Race is concerned it has frightened, terrorized and stampeded the White Race into panic, fear and irrationality. As to the purpose it served (and still serves) Christianity, it is the very essence, the very foundation, on which Christianity has built its vast and powerful empire. It was, and still is the ultimate club with which to cudgel its victims into line- by fear, by panic – to force the gullible peasants to believe as they are told to believe – or else hell fire and brimstone will be their eternal fate. The psychological technique is exactly the same as dealing with innocent but gullible little children. When a child comes into the world, its mind is as blank as a white sheet of paper. As it slowly begins to learn speech – the art of understanding and using words – it is extremely naive, gullible and impressionable. The child has implicit faith in its parents. If its parents describe Santa Claus to the child, show pictures of Santa, the child believes in Santa Claus. To the child the concept is as real as reality itself. If it were told cows are holy, why then it would believe that, too. If the child is told about an evil bogey-man, it will believe that. If the bogey-man is used to frighten the child, and told the bogey-man will get it if it doesn’t behave, then this cruel deception can be used as a psychological club to whip the child into line. To the child the concept is real, and the fear is real, because the child is very gullible. And so it is with the ultimate weapon, the gruesome idea of hell, to the gullible. Unfortunately, people do not cease being gullible when they become adults. Millions of adults are more gullible and superstitious than little children. Although they may now be adults, the concept of hell has been so thoroughly pounded into the brains of the Christian victims from early childhood, that to them the concept is more real than reality itself and much more frightening. Their brains are now like concrete – all mixed up and hard set. As they succumb to panic from even contemplating such a horrible fate that supposedly is in store for them, they become docile victims, ready to believe anything, do anything, at the command of their deceitful superiors in the religious hierarchy. Fear and panic is at the very root of Christianity from its very inception and it has worked wonders on its gullible victims. The terrible weapon is fear – fear of an imaginary concept. That ugly concept is hell. In no other religion has this imaginary but non-existent hell been built up to such an infuriating crescendo as in the Christian religion. True, the Romans had some vague concept of Hades. But it was only a dismal, shadowy place, without any mention of pain or torture. Judaism had its Gehennom or “Valley of Hennom,” a place near Jerusalem, but it, too, was an insignificant concept to which nobody paid much attention. The Jews were too busy imploring their “Jehovah” to help destroy their enemies here on earth. The Mormons and the Mohammedans practically ignore the idea. But it was the Christians, at the suggestion of their Jewish tormentors, who went all out to develop the idea of hell to its utmost horrendous dimensions. It reached its height of frenzy during the Middle Ages, more aptly called the Dark Ages. More than six hundred years ago the Italian, Dante Alighier, wrote “The Inferno,” as base and depraved a piece of literature as has ever been written. It was not even written in Latin but in the vernacular Italian, which in the early 1300’s was nothing more than a vulgar corruption of Latin. I have read the English translation and find it a dull hodge-podge of incoherent phrases – except every now and then it comes up with vivid images of the excruciating pain and suffering of the hapless victims. Yet it has survived for over 600 years and been touted as one of the great pieces of literature of all time. Why ? The reason is that it was extremely useful to the church in further impressing the superstitious and the gullible with the horrible fate that was in store for them if they did not toe the line. For that reason Dante’s Inferno has been praised, publicized and applauded to the skies. It served the church well in its campaign to frighten, panic and stampede the gullible masses into its clutches, to harass them, to tyrannize them and extract the last penny from its bamboozled victims. It is for this reason that “Inferno” has survived as a “literary great,” and not because this dull episode had any merit. When we contemplate the ghastly picture of hell from the foregoing description, we must remember that, fortunately, there is no hell. It is only an image, a fantasy, a concept, a hideous lie. The question is – who conjured and dreamed up such a macabre idea with which to torment and threaten not those in a non-existent after-life, but those living in the real world here on earth ? The answer goes back to those miserable enemies of the White Race who invented Christianity in the first place. Those miserable enemies of the White Race are that gang of Jewish scribblers who wrote the Jewish-Christian bible and then launched a massive propaganda campaign on the great Roman civilization in order to destroy that (White) Roman civilization and the great Roman race. It took the Jews approximately 400 years to do the job, but they were successful beyond their wildest dreams. We have already partially treated the hoax of Christianity in another chapter. In this chapter we are mainly interested in examining the perverted idea of hell, which could only come from sick and twisted minds. We want to point the finger at the culprits and examine the pain, suffering and mental anguish this Jewish concept has caused billions of our race over the last 2000 years. We also want to expose the fraudulent nature of this unholy concept and demolish it forever from the minds of mankind and from the face of the earth. We Creators believe this abominable “spooks in the sky” swindle has tormented the minds of the White Race for too long. It has needlessly caused untold suffering and mental anguish to its gullible victims. It has drastically diverted the course of history for the worse and delivered the destiny of the White Race into the slimy hands of the despicable and repugnant Jews. Therefore we want to clear the White Man’s brains of this odious trash so he can again think straight. We therefore want to further expose this gruesome story and hit it again and hit it hard.